We are seeking the Lord’s guidance as a congregation and will be coming together for a meeting next week after church. As a part of our preparation I shared last week on Listening for the Spirit – to help us know what this means and how to do it. We are continuing on with this theme today. Last time I made the point that it’s normal for believers to be led by the Spirit of God. As Paul says in Romans 8:14, “For all who are led by the Spirit of God are sons (children) of God.” This is simply a part of being in relationship with God. And we also looked at the most common way the Spirit leads us, which is the inward witness of the Spirit. This is when the Spirit doesn’t necessarily speak words, but gives us a deep inner sense of things that goes beyond words; an affirmation or a conviction that teaches and guides us in the way to go. We’re back into our series on the Gospel of John. And I would like for us to focus on the story of Jesus and the Samaritan woman for the next few weeks, and really dig in and see what it can teach us. Last we saw, Jesus he was in Jerusalem talking with Nicodemus. From there he went into the Judean countryside where his disciples were baptizing people who responded to Jesus’ preaching. Then he decided to go up to Galilee, but he went through Samaria to get there. And he ended up staying in the village of Sychar in Samaria for a few days. “4And he (Jesus) had to pass through Samaria. 5So he came to a town of Samaria called Sychar, near the field that Jacob had given to his son Joseph. 6Jacob’s well was there . . .” Although some Jews avoided going through Samaria, many used it as a path between Jerusalem and Galilee because it was faster. However, when John tells us that “he had to pass through Samaria” it isn’t because Jesus was in a hurry. In fact he stayed there for a while. The “had to” points to the Father’s leading. As you will remember, the “Samaritans” came from the remnants of the northern tribes of Israel from the time of the Assyrian conquest centuries before (721 BC) who intermarried with those settled in the region by the Assyrians (2 Kings 17:24-41). At this time Sychar, modern day Askar, was probably the main Samaritan town (because Shechem had been destroyed). Jacob’s well was a ½ mile or so from Sychar. The land that Jacob gave to Joseph is mentioned in the Old Testament, but not the well itself (Genesis 48:21-22; 33:18-20; Joshua 24:32). “ . 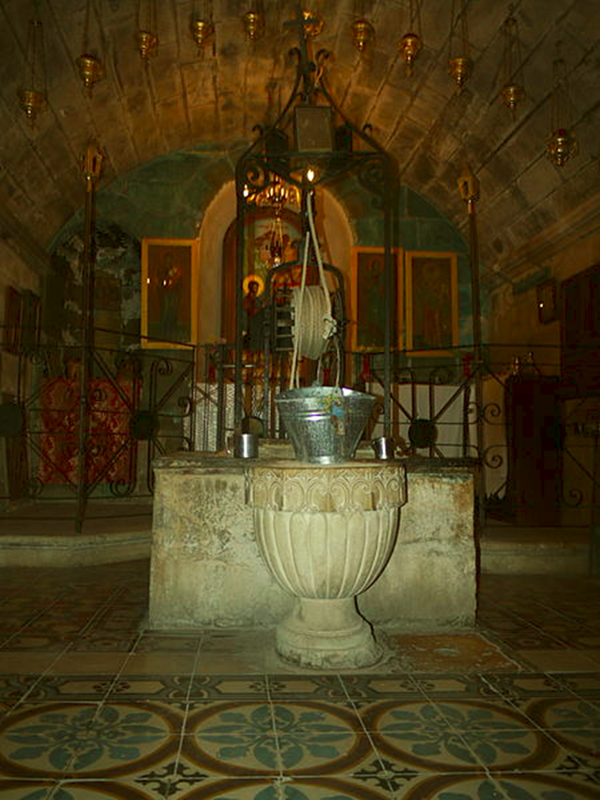 . . so Jesus, wearied as he was from his journey, was sitting beside the well. It was about the sixth hour.” So it’s 12:00 noon which means it’s really hot. And we get a good picture of Jesus’ humanity here – he is tired and, as we will see, he is thirsty. It was the role of the disciple to take care of the teacher. So the disciples have gone to get food. And they would have gotten him water if they were still there. But Jesus asks her for water. 1. The first has to do with gender. It was not generally acceptable in this day for a man to talk to a woman in private that he didn’t already know. John highlights this by noting that Jesus’ disciples were absent. There were a number of Old Testament stories about men talking with women at wells, but these ended with marriage. (Genesis 24:11-28; 29:4-18; and Exodus 2:16-22; but see 1 Kings 17:8-16). That this was unusual is apparent when the disciples come back in v. 27. John tells us that “they marveled that he was talking with a woman.” According to the framework of his day Jesus is stretching things here. 2.The second has to do with morality. Women usually came in groups to draw water in the morning or evening when it wasn’t so hot. Since this woman came alone, in the heat of the day it indicates that she was likely not accepted by the other women of the village. As we learn later, but Jesus already knows, she is sexually immoral. So just as in the first three Gospels, Jesus is relating here to an outcast and someone who would be labeled a notorious or public sinner. 3. The third has to do with religion/culture. Jews considered Samaritans to be a breakoff group that opposed Judaism with their similar but at times quite different faith and practice. They were considered unclean. The woman herself, aware of this boundary, questions Jesus – ‘Why would you ask me for a drink?’ She comes across to me all throughout this story as feisty; she is not afraid to question or challenge Jesus and he is fine with this. John adds the explanatory comment “Jews have no dealings with Samaritans.” That is, in general they didn’t interact. Indeed, there was a lot of hostility between the two groups. (This assumption is a part of the parable of the Good Samaritan in Luke 10). “10Jesus answered her, ‘If you knew the gift of God, and who it is that is saying to you, ‘Give me a drink,’ you would have asked him, and he would have given you living water.’” She has challenged Jesus, ‘Don’t you know who I am – a Samaritan – and you want me to give you, a Jew, water?’ Jesus turns it around, ‘If you knew who I am, a Jew, yes, but much more, you could ask me for a much better kind of water.’ He defuses any animosity between them by noting that he is willing to give her much more than what he asks of her. Here we learn about Jesus’ identity. Jesus is the one who gives “the gift of God” also called “living water.” Living water has a double meaning here. It can mean running or fresh water as opposed to stagnant water, or it can also represent the Spirit. For instance in John 7 Jesus talks about being thirsty and drinking and he talks about how he will give forth rivers of living water. And then John tells us that “this he said about the Spirit, whom those who believed in him were to receive . . ..” – v. 39. So living water refers to the Spirit. And this is “the gift of God” that Jesus gives to those who ask him for it. “11The woman said to him, ‘Sir, you have nothing to draw water with, and the well is deep. Where do you get that living water? 12Are you greater than our father Jacob? He gave us the well and drank from it himself, as did his sons and his livestock.’” She misunderstands Jesus in an overly literal way thinking of running water. She observes that he can’t get it from Jacob’s well because it’s deep, in fact, it’s a 100 ft deep still today – and he has no rope and vessel. • Jacob gave water to the 12 tribes, that doesn’t quench true thirst. And the presence of the Spirit and eternal life within us fully satisfies and fulfills us spiritually. We will thirst no more. So, in answer to her question – yes, Jesus is greater than Jacob. “15The woman said to him, ‘Sir, give me this water, so that I will not be thirsty or have to come here to draw water.’” Again, she takes him overly literally. She wants to drink this mysterious water that will relieve her physical thirst. She doesn’t fully understand, and we will have to wait until next time to see the progress she makes. But she is open to what Jesus has to say. She is asking for the water Jesus gives. Have you asked Jesus for living water? In the same way if you ask Jesus for living water, he will give it to you. Let me say it again, if you ask Jesus for living water, he will give it to you – the presence of the Spirit within you who brings forth eternal life and fully satisfies any spiritual thirst that you might have. If you ask, he will give this to you. Ask him today! Why would you wait? Ask him right now! Are you a part of God’s mission? 1. Divine appointments. Why did Jesus “have to go through Samaria”? Because there was a woman that the Father wanted him to talk to. And Jesus was always in tune with the Father and did just what he wanted. So when I ask are you a part of God’s mission I’m not talking about going on a mission trip, I am talking about your everyday life. Are you looking for divine appointments? Are you in tune with what God wants you to do? Are you open to this? This week? This is my challenge to you – look for these this week. I will be praying for you that God will work through you. 2. Crossing social boundaries. In our story this had to do with gender, morality and culture/religion. Don’t let these stand in the way. One of you shared last week about the young man with an offensive tattoo – well, God wants to reach all kinds of people no matter how different they are than us. Don’t just be shocked, look for the opportunity to relate even if it stretches you. God wants all people to come to know him and worship him. And so we should expect to come across people that are different than us, some so different that it blows our minds. But God loves them just as much as us and wants them to be blessed with the gift of God. 3. A focus on Jesus. When the Samaritan woman raised the divide between Jews and Samaritans – which was meant to kill the conversation, Jesus focused on the living water that he gives to all; that supersedes the divide. In like manner, we are to keep things focused on Jesus as we are a part of God’s mission. When division come up because of differences speak of the gift that Jesus has for all of us. My challenge is be open to how God wants to work through you this week as he seeks people to know and love him. Be open to this; get tuned in. Let God fulfill his mission to the world through you. And I will give you a chance to share next week what God has done.